Select the best college or university for your personal and career goals. Get free cash for college through scholarships and financial aid. Create a strong application and essay that reflect your past accomplishments and future goals. Plus, read 25 inspirational essays written by adult students. Repeat the successes and avoid the pitfalls of previous students. Save money by maximizing credits and your work or life experiences. Despite the pressures of work, family, and a mortgage, you can find encouragement to go back to school with this guide to researching and applying to graduate, undergraduate, and certificate programs. 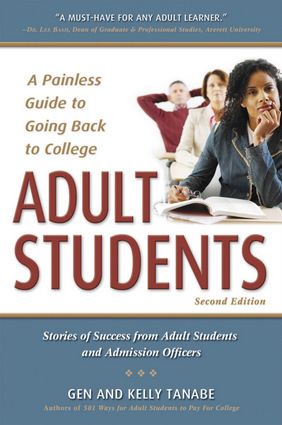 With expanded information on applications, financial aid, admission interviews, on-campus adult student specialists, options for distance learning, and new loan and scholarship opportunities, this resource also teaches you the strategies needed to tailor an application to emphasize life and job experience. Dozens of actual admissions essays show you how to demonstrate knowledge and confidence as you describe why you seek to advance your current career, change careers, or train for a career after raising a family.